It started with a tweet. Somewhere out in the city's eastern suburbs there was a giant plastic baby sitting on top of a petrol station. Was it still there, and how did it get there in the first place? Someone thought I might know, or might be curious enough to find out. They weren't wrong! Locating the baby - on a map at least - turned out to be simple. What was more complicated was tracking its route, taking it back from its current position to the place of its birth. Following this path led me to its famous father - who abandoned it, and its adopted father - who has taken great care of it! This is its story. In January of this year I was tagged in a strange tweet. aha @JethroMassey maybe @INVISIBLEPARIS can help! 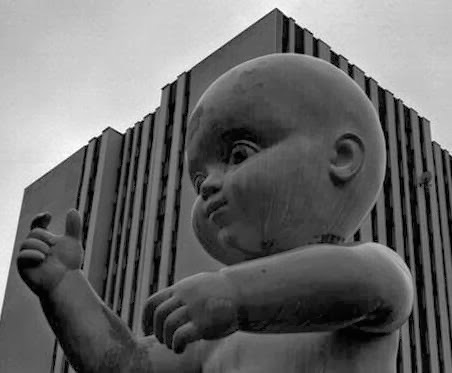 IP have you seen a giant baby on top of a petrol station vaguely near NE Paris/outskirts?! I hadn't, but I was intrigued. After a brief exchange of tweets, the original requester eventually found a trace of the baby. In addition to the address, the tweet linked to an article in the Le Parisien newspaper, apparently the last online reference to the baby. This mention dated back to 2002. Would the baby still be there? Obviously there was only one way to find out. Before heading out to Noisy Le Sec though, I wanted to know why Jethro (a Paris-based British filmmaker) was looking for the baby. It turned out to be good old fashioned nostalgia, coupled with a need for reassurance that oddities can withstand extensive urban (re)development. "I saw it the first time about 10 or 11 years ago" Jethro told me. "I was working in a bar at the time, and looking to get a break in the french film industry, so I ended up helping out with the "regie", making coffee and driving people around on a few short films. One of them was "En Route Mauvaise Troupe" and a few scenes were shot at that garage. I was amazed they didn't include the baby in any of their shots - it seemed to be the most interesting thing about the place!" The place. The baby is now a place marker, a curiosity, an attraction, but what is the significance of the place? To find out, I decided to walk to the garage, idiotically choosing a windy, rain-lashed day. The best way to get to the baby from Paris is to follow the Canal de l'Ourcq. Interesting on a summer afternoon, the cobble paths - and associated puddles - are more of an ordeal in winter, especially when you also need to avoid a multitude of joggers and cyclists. In Pantin, I therefore decide to skip up to the main N3 road, an ancient route that eventually leads all the way to Germany. It is on this road that the baby is situated, but I was further away from it than I thought. With the rain stopping, I could now take the time to observe my surroundings - but they were not particularly glorious. Empty factories, a Bar-Tabac-PMU, a DIY store with pockets of 'illegal' hands for hire gathered outside and various mysterious 'tout confort' hotels (who stays here?). Onwards, up over a bridge spanning a dozen railway lines and a chaotic landscape beyond. Coming back down to earth I arrive in Noisy Le Sec, the baby's home. But where was it? The route becomes more difficult to follow in an environment designed only for motor vehicles, forcing me to walk in the bus lane. On both sides of the road are ruined and empty buildings. High up on an overgrown bank alongside one of these, a strange carved head surveys the territory. It seems to be looking out towards a camp of sedentary travellers. It's a rather desperate spot (although it does back onto the canal), but one filled with domestic comforts, including forests of satellite TV aerials and banks of washing machines installed outside the caravans. Just beyond a circus tent - advertising 1980s themed dinner dances on Friday and Saturday evenings - I spot it at last. And it is large - over 5 metres high and weighing more than 600kg according to the article published in Le Parisien. Although it does sit alongside a petrol station, it is actually situated in a used-car lot. It doesn't sit on a roof either, but is instead comfortably installed on a concrete pedestal. It's looking a little scruffy but seems happy in its adopted home. I walk into the car dealership and ask if I can take some photos. The owner gives me permission and we chat a little. He confirms what he had already revealed before to the local newspaper. He'd first seen the baby in a wasteground in La Courneuve, and immediately felt an affinity. When the opportunity arose to buy it in an auction it was an occasion he couldn't miss. "The adoption is definitive" he told Le Parisien. "When I leave here it's coming with me!" He also confirmed another fact reported in the article. It is indeed a Philippe Starck creation. But why did a Philippe Starck design end up in a La Courneuve wasteground? This he's not sure about, so I decide to head back to Paris and see what I can find. The only clue I had came from the newspaper article - that it had been created for a toy shop in Paris that had since gone out of business. Phlippe Starck's official website provided the rest of the information. 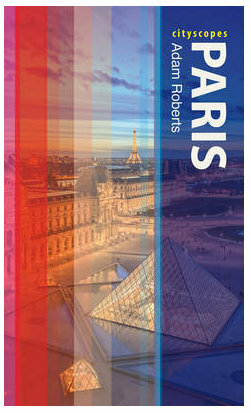 Looking through the chronology of his missions I find reference to work he'd done in a shop called Jouets & Cie in 1986. The official website even provides a rather spectacular photograph, showing that the baby was originally painted entirely in gold! The shop was apparently very large, but went out of business the year I arrived in Paris. It was situated on Boulevard Sebastopol, in the spot where today you'll find a store selling musical instruments, a branch of Gap and a Starbucks cafe. Interestingly, I learn that there was also another important creation in the store, but one that has since remained of some value. 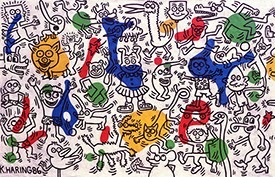 On one of the walls was a huge 2,7m x 4,2m mural painted by Keith Haring. After the shop went out of business it seems that it was acquired by a collector, and has only rarely been seen since (although it did come back to Paris briefly in 2006). If anybody experienced the store I'd be interested to hear what you remember about it! How the baby got to a wasteland after the shop went out of business will probably always remain a mystery to me, but the golden child was obviously no longer wanted. This is why it is so pleasing to see that it has been given a second life, and is being looked after so carefully in Noisy-le-Sec. There remains one final mystery. When I was chatting to the current owner he revealed one further intruiging detail. He has been told that Philippe Starck originally created two babies, and that - as far as he knows - the second child is currently living somewhere in Lille. If anyone has any information, please let me know. It would be great to one day reunite the twins! What a great story! You're a trooper, slogging through wind and rain and puddles to achieve your quest. Thanks for sharing! I found the baby on Google Earth, too, and you can see it in Street View quite well - but apparently Google's privacy algorithm thought the baby might cherish its privacy, because the face is pixellated - though not the rest of its naked baby body. I never thought about just doing the walk on Google Street View. It would have been a lot dryer! That's brilliant about the pixellated face anyway! Fascinating! Hoping for a second finding and a second post on the matter soon. Interesting that a creation of the great Phipippe Starck didńt save the store from going broke. Maybe his fees were so high that it drove thim to babkrupty!!! 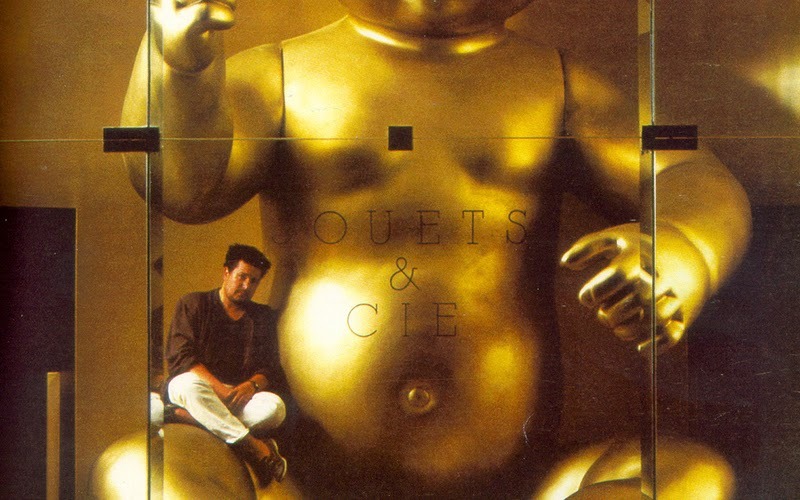 Marc: I think the fact that the shop purchased a Starck and a Keith Haring was surely a 'folie de grandeur', rather typical of the mid 80s. The fact that no-one seems to have even heard of the shop is also a sure sign that it didn't do enough business to justify these purchases!